4 months of Engineering and Pre-Job Planning; 10 days of daylight operations to complete. While drilling a Montenay horizontal well, a major operator took a kick resulting in a blowout. After capping operations and killing the well, another drilling rig was mobilized. Drill pipe backed off at 2400m. A 4 1⁄2 liner was hung in the 9 5/8 surface casing and cemented in place. A 60m cement plug was spotted above the liner top packer and the well was suspended. Years later, gas started migrating to surface around the lease. 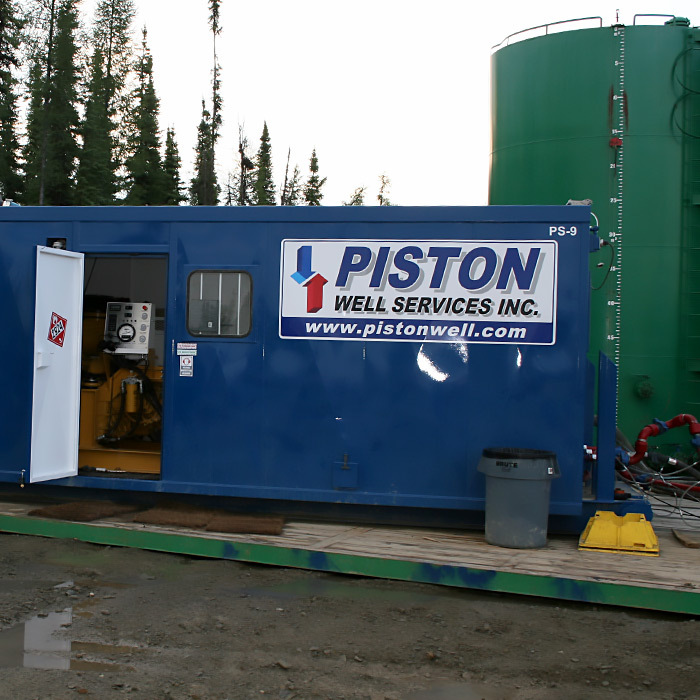 Piston was contacted by the oil company and plans were made to re-enter the well and log casing for cement bond. Complications with milling the cement plug included the risk of gas migration through the 4 1⁄2 liner (up to 6000psi), creating a piston effect buckling and ejecting tubing while milling with 360,000lbs of lift under the plug. Other complications arose from the suspected gas bearing zone being sour. Piston and the oil company engineered the solution of rigging up a 285k jack with a full 11 inch stack; RIH with 8 1⁄2 tri cone bit and 3 1⁄2 IF drill pipe; mill cement while holding 21mpa on the annulus with the use of 2 choke manifolds and a P-tank. If a kick was encountered, the gas cap could be bled off and continue milling to liner top packer. POOH and RIH with 3 5/8 bit, 6 drill collars and 3 1⁄2 string to mill cement out of liner. POOH and RIH with 3 5/8 bit, drift string mill, and l-80 tubing, cleaned down to 2400m plugback.